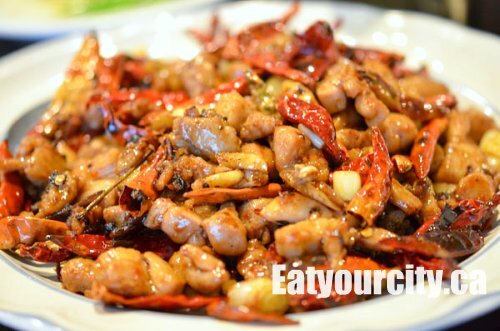 It started with a craving... then when a fellow foodie had a craving for flavorful and spicy food, I had the perfect excuse to call up other like minded foodies and hit up Old Szechuan in downtown Edmonton. I loooove spicy food, with a caveat that the food is as super flavorful as its spicy... and not just one big plate of lava. Looking like a converted ramshackle house with a dirt/gravel parking lot, this little unpolished gem is one of the best places in Edmonton to have traditional Szechuan fare. Translation - food with lots of flavors and packing plenty of heat to boot... some dishes comprise of 50% chili peppers. For those that are faint of heart, or prefer to have your tongue unperforated at the end of the meal - fear not, as all dishes can be made from a spicy level of zero to a check sanity level 7. Just be sure to let the waitresses know or you'll be having your meal prepared at the heat level its traditionally offered at. Red table cloths and an abundance of red decor gives the interior and its occupants a ruddy glow. With a small aquarium of live crabs and fish in the front, and tantalizing smells drifting out from the kitchen, we're quickly seated and scanning the very extensive menu.